Almost ALL EVs are fun to drive. You can’t say the same for all ICE (gas) cars. However, there is obviously a pecking order and this is obviously one man’s opinion (and ONLY one man’s opinion, I’m sure that my better half will have her own opinion of all three vehicles). The models being compared are a 2008 Tesla Roadster 1.5, 2011 BMW Active E, 2013 Tesla Model S S85 (firmware as of today’s publication February 2014 v5.8.4 (1.49.57)). So… What does that make the Active E… I would put that closer to a Tie Fighter. Needs a Star Destroyer or Death Star to get from place to place and no long range flight or warp capabilities. Aside from the SF analogies, how do we compare three vehicles that continue to be near and dear to my heart. Let’s look at the three vehicles in eight categories. Range, Speed, Maneuverability, Telematics, Infotainment, Integration with Work, EV Efficiency, and Cost. With just the raw range, the Model S is the hands down winner for this category as the expansion of the Supercharger Network and the speed with which one can recharge at these Supercharger stations makes it a moot point, for long distance charging. Living thirty miles from the Hawthorne Superchargers makes this a potential refill before topping off at home for the fastest recharge of the 265 miles that the Model S can go. At home I have NEMA 14-50 and 6-50 outlets that provide me with 40 Amp charging for either the Model S and the Roadster and the car can turn around quick enough to make range a non issue. The Roadster with its 170+ miles of range is also rather easy to fill up. Living near several Tesla Stores and Service Centers that still have the 70A Roadster High Power Wall Chargers (HPWC) give me the public option to top off rather quickly. Furthermore the NEMA 14-50 and NEMA 6-50 outlets at home will let me recover faster than my 30A J1772 EVSE from Chargepoint. So, the Active E must be the loser in the range battle, right. Well, not really, with a 240V plug at both ends of a daily commute, living in Southern California with ready access to many public J1772 stations, the Active E is a solid contender for this title for traveling within the Los Angeles Basin. I have done several 140 mile days with no real problem and even a few 300+ mile days. Though the Model S is the clear winner, the other two vehicles do a decent showing in my garage. As I’ve said about the Active E in the early days of “ownership”. The range of the Active E is unlimited, as long as you have access to electricity AND the time to wait for it to recharge. The Model S has 3 points, Roadster with 2 points, and the Active E with a point. Well, how do we measure speed? Top Speed? 0-60 MPH (0-100 KPH)? Yes and Yes. So, the Roadster is built for speed and though the P85+ will challenge the Roadster, our S85 is NOT a P85 or P85+. The Active E is quicker than MANY vehicles on the road, but not as fast as either the Roadster and S85. So, Roadster 3 points, Model S 2 points, and Active E has a point. Maneuverability is a function of size and handling. The Model S is a great car. It’s just too big for me. It’s nimble and everything, but, so are both the other two cars. The Roadster is small, nimble, and quick. But it’s tiny and hard to see. It makes driving the Roadster harder to drive day-to-day. The Active E is just right. It’s quick. small, but easy to see and spot. When driving in traffic, the Active E is the best one of the three. The Roadster is in the middle and the Model S is in last place. So, Active E 3 points, Roadster 2 points, and Model S has a point. The Telematics of the vehicles become a more complicated calculation because the Roadster, as originally equipped had no Telematics. However, thanks to our friends at openvehicles.com and the development of OVMS, the Roadster is comparable to other modern EVs. You can read my original post on telematics to compare the Active E, Nissan Leaf, and Tesla Roadster. So, how do we score the Roadster. It’s my blog and post, so I say that we rate the Roadster WITH OVMS as that’s the only way to really get the most out of this category for the car. Telematics on the Roadster equipped with OVMS is top-notch. Once configured properly and the correct SIM card plan is purchased from AT&T, it works great, however, it costs $100 a year to keep the service going. The Active E included the Telematics for the entire two year program and the Model S has yet to determine whether Tesla will begin to charge for that. The Model S has an API that has allowed folks to control the car better with the VisibleTesla project (as well as the github for it here) and the GlassTesla App for the Google Glass that pretty much gives the Model S owner multiple avenues to control and view the status of the vehicle. This is a hard one for me to score as it is such a critical feature for the car and one of the Telematics feature that I often use has been the SEND TO CAR feature that Google Maps supports. 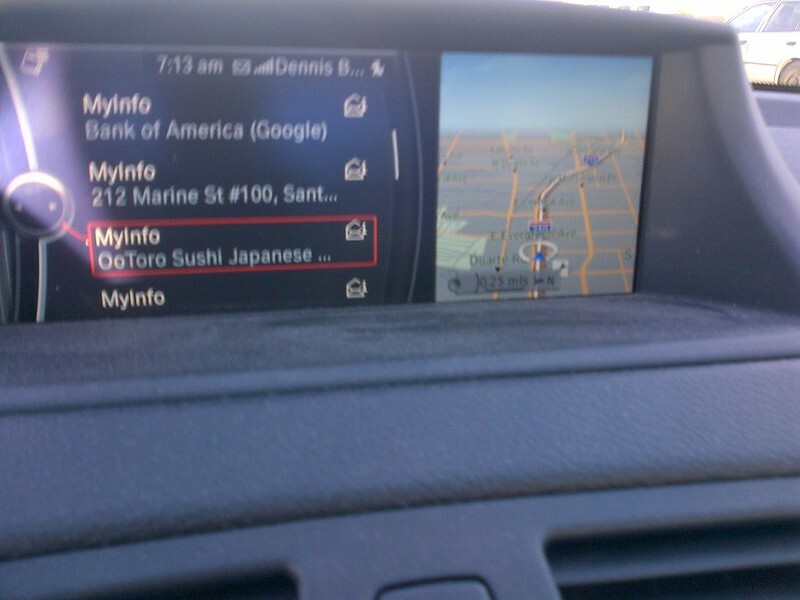 The big car manufacturers have allowed end users to send a destination to their vehicle. Tesla does not currently support this, but all current BMWs with BMW Assist have access to this and therefore the Active E has this capability as well. However, the new version of Maps has this feature currently disabled, so it’s a non-issue. All three iOS versions of the Telematics Application overlays the vehicle location on a map. Both OVMS and Tesla’s Model S will show you the vehicle location anywhere that you have Internet access. The Active E application limits one to view the location of the vehicle when you are about a mile away from the vehicle. Once you are further, the vehicle will not be displayed on a map. This deficiency is a drag on the capability of the Active E Telematics. The preconditioning controls and remote charge start/stop of the Active E is better than either of the iOS versions of the Tesla Controls. However, the Roadster can be configured to chargestart and the like via SMS and the Model S can be schedule charged using the VisibleTesla application. 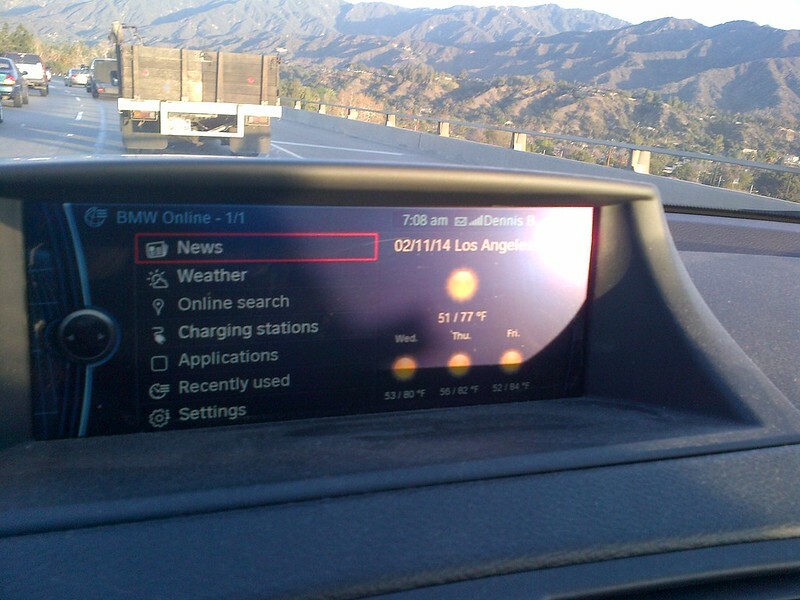 The Active E allows one to schedule a delayed charge start as well as start to precondition the car. The difference in Active E preconditioning from Tesla Model S preconditioning is the Active E one actually warms up (or cools down) the battery to ensure that it gets to an ideal temperature and then takes care of the cabin. Whereas the Model S one just takes care of the cabin. The Roadster does not allow for either preconditioning cases,since I live in mostly ideal weather part of the country, where it is rarely too cold or too hot, it’s a non issue. One of the drawbacks to the Active E is its lack of community support it for App development, so in totum, it’s a wash. So, as configured, Roadster 3 points, Model S 2 points, Active E 1 point. With the big touch screen we should just hand the Model S the top score. Not so fast. One thing that we can count on is the fact that the Roadster does hold the bottom part of this section. How could the Active E score better than the Model S in THIS section? The Active E has one USB port, the Model S has two USB ports, and the Roadster has a solo iPod 15 PIN connector. The Model S port only allows for music to be played on a USB drive on it OR use the port to charge an iPod/iPhone on either USB port. The Active E port can read music from a USB Drive or support an iOS device to play from its directories. Playlists and everything. The Roadster will allow an iOS device to play, but it will not support charging a modern 15 pin device. Score one for the Active E.
If you don’t have an iPod or music on a USB drive, can you connect any audio device via an analog connection. Both the Model S and Roadster is a no. However, the Active E includes that in its package. This means that you can even bring a cassette player in the car… Not that I ever did, but I could have. The Model S can get Sirius XM on it. However, you have to spend $2,500 to have the capability added to your build. (This is a $1,550 increase over the original price for the package). Both the Roadster and Active E have this built in and works just fine. Am I just ignoring all the cool Internet Radio things that the Model S has? Not really, I just feel that all that cool Internet Radio gets eliminated by the practically nonfunctional AM Radio in the vehicle. I live in a major metropolitan area and like to listen to AM Radio for my Local Sports Talk and when the Lakers are playing. That station AM 710 KSPN Los Angeles does have a streaming feed that works fine for talk radio. However, because of their licensing, they do NOT broadcast the Laker game. Granted the Lakers have not been playing well this season. But it still is content that I wish to receive that I have difficulty doing so on the Model S. Additionally, we’ve been living under the threat of losing the cool Internet Radio stuff, so don’t really feel like counting on that. So, surprisingly, the Active E takes the lead here and the Model S takes the second spot with the Roadster third. This is a funny section for most people that are comparing vehicles, but when you drive as I do and commute as far as I do, it is important that I am able to conduct business calls, etc. while I drive. A critical first feature to this integration is Bluetooth. All three cars can connect to a bluetooth source and play music from a bluetooth source. Both Teslas can only connect and stream to one bluetooth device, whereas the Active E can have MULTIPLE bluetooth devices connected to the car. A primary and secondary telephone as well as identify one of these sources for bluetooth audio streaming. 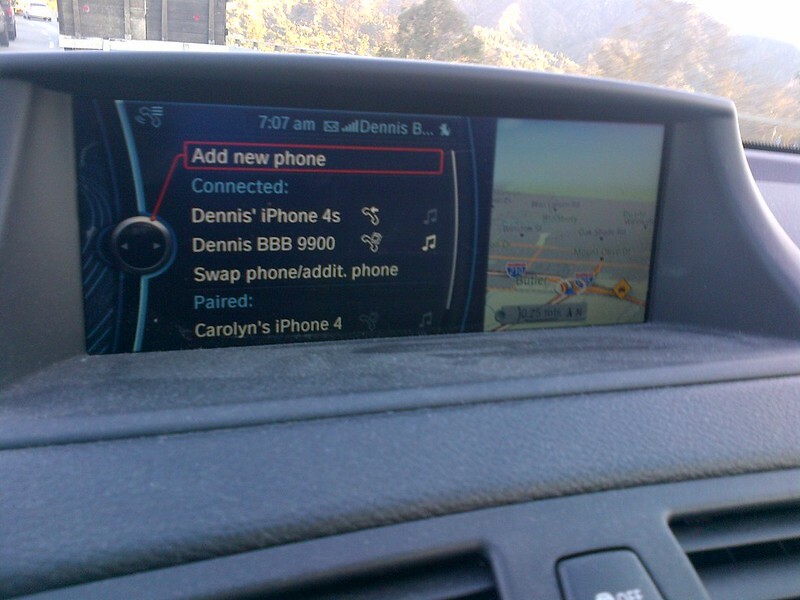 When using Siri on an iPhone 4s, the audio will play through the vehicle. I don’t have that happening on either Tesla. Granted, I may not be doing this correctly on the Model S, in which case the Model S still fails BECAUSE of the requirement to only connect one device at a time via bluetooth, instead of having a standby device be recognized and paired. Therefore, on a long commute, when I need to make a call, there is a delay for me to get back to my entertainment when my call disconnects. Especially since I may be streaming my iPod through the same connection that I am making calls with it. Here is the Active E set up to connect to two bluetooth devices at the same time. 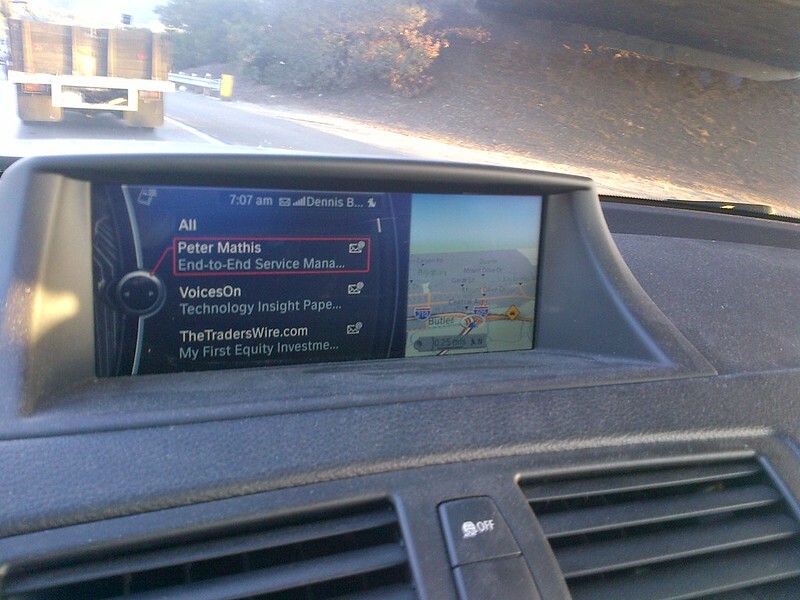 The BMW allows me to see my text messages, emails, and service messages on the screen while I drive. Additionally, I can have the vehicle read these out loud for me. Granted, the Model S does have that large browser on the screen, but it really isn’t safe to load Outlook Web Access while driving. Internet access is obviously much better on the Model S, but the Active E is no slouch either. The Model S Internet is currently free, but this is under threat of changing “any time” so, the Active E can hold its own under these conditions. And on a last note, bluetooth audio calls are best on the Active E, not so great on the Model S, and downright poor on the Roadster, which is also how I ranked them on this section. This is an unfair competition as we received our gently used Roadster as part of Tesla’s Certified Pre-Owned program and with the 37,000 mile and 37 month warranty that goes with it it makes the Roadster the hands down winner in the cost department. The Active E with the unlimited mileage lease could have taken the lead, but I discounted it because it is a lease. The Model S was definitely the most expensive of the three vehicles to own and operate… Though after three years, perhaps the Roadster would be more expensive. We shall see. If we tally up the points, the Model S is at the bottom with fourteen points and we have the Active E and Roadster tied at seventeen points each. How do I pick a winner? Seriously, the three points that the Model S is deficient in can easily be fixed with a Software Update after the 5.8 that it currently has in firmware. A software patch can be sent out to that vehicle to give it better Bluetooth handling or be able to read the file system of a connected iPod to the USB port. These sort of things can easily bridge the three point gap between itself AND either the Active E or the Roadster. That’s what makes the Model S amazing. I’ve already voted for these vehicles with my pocket book. We’ve purchased the two Teslas and committed to the Active E for the two years that we’ve been fortunate enough to lease it. Now, if only Tesla added coat hooks to these vehicles, they would be perfect.